The University of Wisconsin System and UW-Madison prohibit the unlawful possession, use, distribution, manufacture or dispensing of illicit drugs (“controlled substances” as defined in Ch. 961, Wis. Stat.) and alcohol in accordance with s. UWS 18.09, Wis. Adm. Code, by students. The use or possession of alcoholic beverages is also prohibited on University premises unless expressly permitted by the chief administrative officer or under institutional regulations, in accordance s. UWS 18.09, Wis. Adm. Code. Without exception, alcohol consumption is governed by Wisconsin statutory age restrictions under s. UWS 18.09(1)(b) Wis. Adm. Code. Illegal use, possession, manufacture, or distribution of alcohol or controlled substances is subject to disciplinary action. UW-Madison will impose disciplinary sanctions on students for violations of UW-Madison’s code of conduct. Such sanctions are administered by the Office of Student Conduct and Community Standards in the Division of Student Life through the disciplinary process outlined in Chapter 17 of the UW System Administrative Code. Sanctions, as defined by s. UWS 17.10 Wis. Adm. Code, are any of the following: a written reprimand, denial of specific university privileges, payment of restitution, educational or service sanctions including community service [and referral to appropriate counseling or treatment programs], disciplinary probation, imposition of reasonable terms and conditions on continued student status, removal from a course in progress, enrollment restrictions on a course or program, suspension, expulsion. The University of Wisconsin System and UW–Madison prohibit the unlawful possession, use, distribution, manufacture or dispensing of illicit drugs (“controlled substances” as defined in Ch. 961, Wis. Stat. ), in accordance with s. UWS 18.09, Wis. Adm. Code, by employees on university property or as part of university activities. The use or possession of alcoholic beverages is also prohibited on university premises, except in faculty and staff housing and as expressly permitted by the chief administrative officer or under institutional regulations, in accordance with s. UWS 18.09, Wis. Adm. Code. Without exception, alcohol consumption is governed by Wisconsin statutory age restrictions under s. UWS 18.09(1)(b) Wis. Adm. Code. Illegal use, possession, manufacture, or distribution of alcohol or controlled substances is subject to disciplinary action. UW-Madison will impose disciplinary sanctions on students for violations of UW-Madison’s code of conduct. University employees will be subject to disciplinary sanctions, up to and including termination from employment, for violation of these provisions occurring on University property or the work site or during work time. In addition to discipline, or in lieu of it, employees may be referred to appropriate counseling or treatment programs. Disciplinary sanctions are initiated and imposed in accordance with applicable procedural requirements and work rules, as set forth in Wisconsin statutes, administrative rules, faculty and academic staff policies, and collective bargaining agreements. Referral for prosecution under criminal law is also possible. Further, violations of s. 18.09, Wis. Adm. Code may result in additional penalties as allowed under Ch. UWS 18, Wis. Adm. Code. Employees convicted of any criminal drug statute violation occurring in the work place must notify their dean, director or department chair within five days of the conviction if they are employed by the university at the time of the conviction. Drinking too much can harm your health. Excessive alcohol use led to approximately 88,000 deaths and 2.5 million years of potential life lost (YPLL) each year in the United States from 2006 – 2010, shortening the lives of those who died by an average of 30 years. Further, excessive drinking was responsible for 1 in 10 deaths among working-age adults aged 20-64 years. Violence, including homicide, suicide, sexual assault, and intimate partner violence is linked with excessive alcohol consumption. Risky sexual behaviors that can result in unintended pregnancy or sexually transmitted diseases, including HIV. Injection of drugs such as heroin, cocaine, and methamphetamine currently accounts for about 12 percent of new AIDS cases. Injection drug use is also a major factor in the spread of hepatitis C, a serious, potentially fatal liver disease. Injection drug use is not the only way that drug abuse contributes to the spread of infectious diseases. All drugs of abuse cause some form of intoxication, which interferes with judgment and increases the likelihood of risky sexual behaviors. This, in turn, contributes to the spread of HIV/AIDS, hepatitis B and C, and other sexually transmitted diseases. Referral Programs to Off-Campus Treatment Providers for Students: UHS maintains referral sources and care management specialists who assist students requiring treatment referral. Referral Programs to Off-Campus Treatment Providers for Employees: All of the State of Wisconsin health care insurance options have a substance abuse treatment benefit. EAO will make referrals to treatment centers based on an employee’s health insurance and/or refer to self-pay options. In the case of a formal referral from a supervisor or a human resources manager, EAO will provide case management on attendance and compliance. Employees can also consult their personal physician for referral information and assistance. 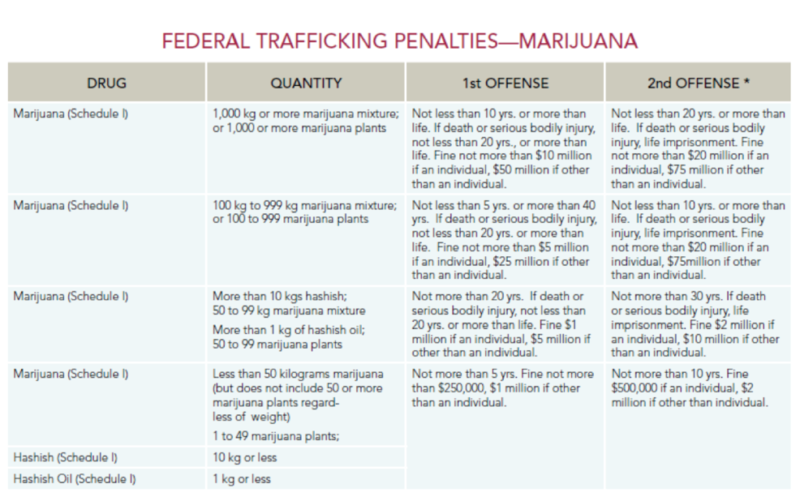 Below are charts that provide an overview of federal trafficking penalties. 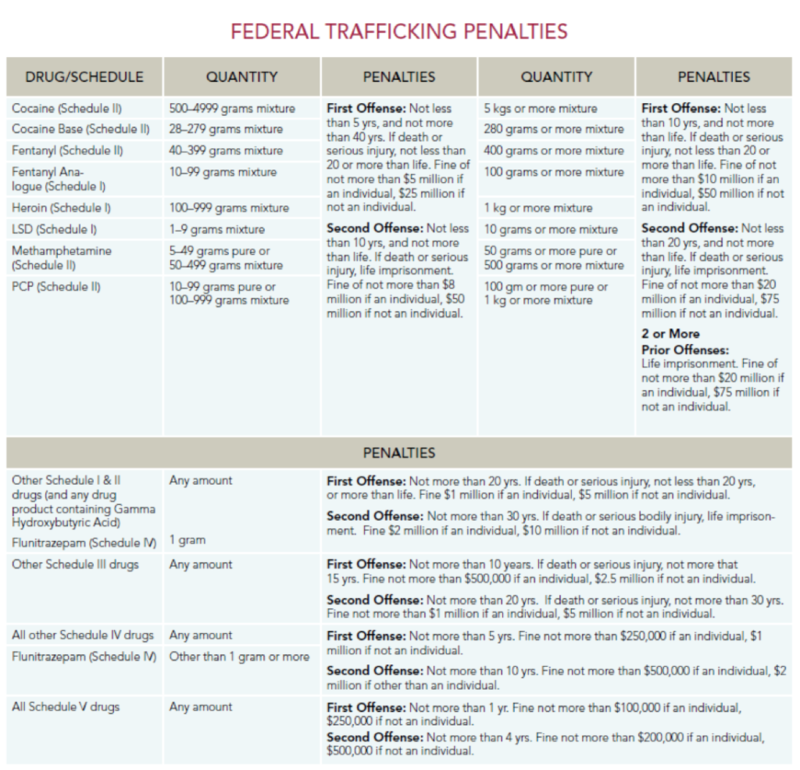 Charts can be located at https://www.dea.gov/pr/multimedia-library/publications/drug_of_abuse.pdf#page=30 and https://www.dea.gov/druginfo/ftp3.shtml. The laws of Wisconsin prohibit the sale of alcohol to anyone who has not reached the legal drinking age of 21, and there is a concurrent duty on the part of an adult to prevent the illegal consumption of alcohol on his/her premises. Wis. Stat.125.07(1)(a)(1). Repeated violation of this statute can result in imprisonment of up to 9 months and fine of $10,000. Wis. Stat.125.07(1)(b)(2)(d). It is against the law for an underage person to attempt to buy an alcoholic beverage, falsely represent his/her age, or enter a licensed premises. Violators of this law can be fined $1000, ordered to participate in a supervised work program, and have their driver’s license suspended, Wis. Stat. 125.07(4). The laws of Wisconsin prohibit possession, manufacture, distribution and/or delivery of controlled substances through the Uniform Controlled Substances Act, Wis. Stat. 961. Manufacture, distribution or delivery of a schedule I or schedule II narcotic drugs is a Class E felony subject to up to 15 years in prison and a $50,000 fine, with exceptions. Wis. Stat. 961.41(1)(a). Manufacture, distribution or delivery of a schedule I, II or III non-narcotic drug is a Class H felony subject to 6 years in prison and a $10,000 fine, with exceptions. Wis. Stat. 961.41(1)(b). Additional sanctions vary based on the type of controlled substance, the amount of the controlled substance, whether the individual possessed, manufactured, distributed, delivered the controlled substance or intended to do so, and the number of previous offenses by the individual. For all penalties see Wis. Stat. 961.41, Wis. Stat. 961.42, and Wis. Stat. 961.43. For example, manufacture, distribution or delivery of more than 40 grams of cocaine is a Class C felony subject to 40 years in prison and fine of $100,000. Possession of cocaine without intent to manufacture, distribute or deliver is a Class I felony subject to 3 ½ years in prison and fine of $10,000. In addition to the stringent penalties, prison sentences can be increased when aggravating factors are present, such as when a person distributes a controlled substance to a minor, Wis. Stat. 961.46 (1). Citations for underage drinking, possession of a fake ID, and other alcohol-related violations may be issued by the University of Wisconsin Police Department (UWPD) or the City of Madison Police Department (MPD). In both cases, they have the full force of law and are not just “disciplinary reminders” that will disappear upon graduation. Fines must be paid and court-ordered sanctions must be fulfilled. Both the University Police and the City of Madison notify the Office of Student Conduct and Community Standards of any students who receive alcohol-related citations from the Madison Police Department.